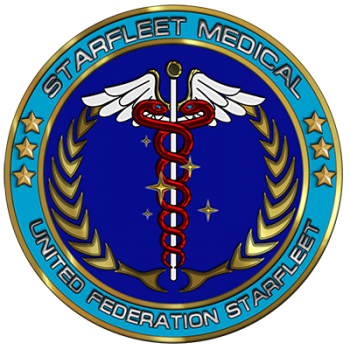 The UF Starfleet Medical Corps is the branch in charge of the physical and psychological well being of all starfleet personnel. This means more then simply healing injured crewmembers but also creating preventive measures to ensure the crew doesn't get sick or injured to start with. CMOs of all ships and stations monitor the health of all crewmen by doing regular examinations. They are also called upon for humanitarian related missions. The Medical Corps also ensures all of its medical personnel is trained in the use of equipment and are trained in effectively diagnosing a patient. The medical corps is also responsible for all medical research conducted on ships and stations in conjunction with the ship/station's science department. They develop new medicines and undertake research in exobiology and xenology. This page was last edited on 22 October 2016, at 20:27.